An exceptional, fine and impressive antique George V English sterling silver jewelry box, an addition to our collection of boxes and cases. 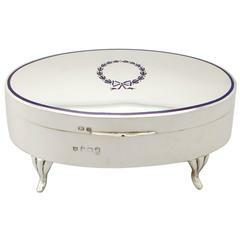 This exceptional antique George V sterling silver jewelry box has a plain rectangular form. The surface of the body and sides of the cover are embellished with impressive engine turned decoration. 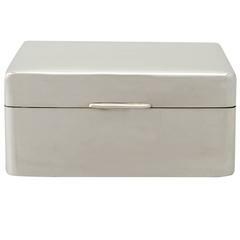 The impressive hallmarked hinged solid silver cover is fitted with a rounded thumb piece to the anterior surface and retains the original gilded interior. The upper portion of the cover is embellished with a panel of engine turned decoration, identical to that of the body and encompassed with an engraved Greek Key style fret band. The body of this fine 1920s jewelry box retains the original cedar wood lining and compartmentalized with a bespoke navy blue velvet fitment with a central well and two integrated ring holders to either side. 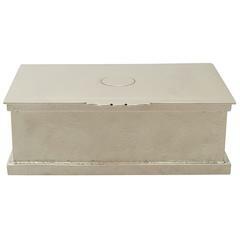 This antique box has a weighted base retaining the original leatherette lining to the underside. The underside of the box bears the retailer's mark 'Walker & Hall, Sheffield,' in addition to the registration numbers. Note: The majority of such boxes have a wood lining to the cover, it is a sign of quality when boxes have an unlined, solid silver cover. Dimensions: Length 17.8 cm/7". Width 9.4 cm/3.7". Height 5 cm/2". Weight Not measurable as weighted base. Condition This antique 1920s jewelry box is an exceptional gauge of silver, exceptional quality and in excellent presentation condition. The engine turned decoration is very crisp. The original gilding to the interior of the cover has some natural wear in keeping with age. Full hallmarks struck to the surface of the rim and part hallmarks to the surface of the cover are all very clear. Maker: Walker & Hall. Origin: Sheffield, England. Date: 1928. Reflections in photographs may detract from the true representation of this piece of antique silverware. This antique 1920's jewelry box is exceptional quality and in excellent presentation condition. The decoration is very crisp. The gilding has some natural wear in keeping with age. Full and part hallmarks are all very clear.